This beautiful home reflects the nature surrounding it. Only minutes from the city, this is in a world of its own. Tucked away from the street behind the privacy hedging, the villa facade only gives a hint of what is beyond. The home has been cleverly designed and enhanced by Young+Richards Architects to maximise the light and outlook on to green space. From the park at the bottom of the garden and back up to the house itself through the gorgeous mature fully landscaped garden, the city beyond recedes and nature beckons. Inside the home, the interior design coordinates an expansive use of natural stone and timber surfaces and finishes, enhancing what the setting provides, while a minimal colour palette removes distractions. The interiors pay tasteful homage to the traditional features of the villa beginnings. The levels provide flexible spaces for everyone, either tucked away or opened up for great expansive living. Indoors or outdoors, you will find this is a property adapting to your needs and moods. 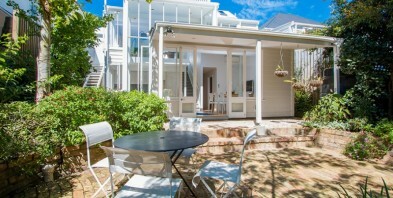 All this, minutes from the hustle of the city centre, Ponsonby Road and the Waterfront. Calling nature lovers, city escapees, design disciples and style seekers. Your wonderful new home is ready.